Flight and Hotel stays not included. Lunch to be provided during each day. Alex has worked in specialty coffee for over a decade. In 2005, Alex started in coffee working as a barista in his home town of Eugene, Oregon. In 2009 he competed in, and won, the Northwest Regional Barista Competition. Alex has had the honor of working guest barista shifts in Iceland and Sweden, and has volunteered for numerous national and international coffee events. In 2012 Alex joined the team at Portland’s Heart Coffee Roasters. Over the course of a nearly 6 years at Heart he worked his way from barista, to managing and leading their training department, to working in quality control and green buying. Outside of coffee Alex enjoys traveling, experiencing Oregon’s incredible natural beauty, and Cats. He is also a pretty good cook. SET will take place in bustling city of Bandung, West Java at 5758 Coffee Lab in partnership with SCAI, ACE, and Barista’s Craft. April 29th – May 3rd (Monday – Friday). Friday May 3rd will be a farm visit. Our host will take us out into the country to see the inner workings of a coffee farm and learn more about the vibrant coffee community in Indonesia. This SET course in Indonesia will be a unique practice opportunity for anyone who is hoping to participate in COE National Jury testing. 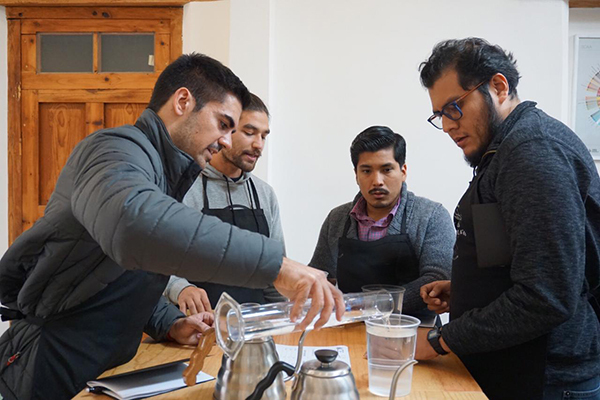 SET is a fantastic benefit to anyone who is looking to improve their general cupping skills and knowledge of coffee. In-depth lectures and discussions on COE, what is specialty coffee and what makes COE coffee unique. Various sensory exercises designed to help you grow in how you perceive and understand aroma and taste. These exercises will be the start of learning to calibrate with the group. Tastings designed to demonstrate the importance of correct cupping procedure and the effects of different variables on cup profile. Tasting common defects in coffee. Learning about the COE method for scoring coffee. Calibrating with a diverse group of cuppers over multiple cupping sessions. Introduction and discussion around COE’s unique way of evaluating cuppers skill and confidants. A test designed after the program COE uses to select National Jury members. During the class we will be cupping and scoring coffees from all over the world. You will taste a wide range of processing methods and varieties. You will taste coffees that score below specialty grade (below 80) to COE National Winner Coffee (84+), COE quality (86) to COE Presidential award-winning coffee (90+). It is a rare opportunity to evaluate such a diverse range of coffee. The majority of coffee that will be tasted will represent scores 84 and above. This will give you a unique window into what it is like to participate in a COE Jury. At the beginning of the class you will receive a COE cupping spoon and an apron along with other fun things. Upon completion of the class you will receive a certificate of completion signed by your instructor, Danny Pang and the Executive Director of ACE, Darrin Daniel. Within three weeks’ time you will receive an email containing the results of your testing. The information you receive will be in the same format as those who undergo national jury testing. We’ll be actively standing during cupping and seated for discussions so please wear comfortable clothing and shoes. Absolutely no use of perfume or cologne allowed. Classes will begin at 9:00 and finish at 4:30 pm with an hour break for lunch, which will be provided. Please bring a notebook and any samples of coffee you would like to share. This experience is intended to share with you the Cup of Excellence program, improve your cupping and sensory evaluation skills and to also share with others in a jury setting. This is the best way to learn and calibrate your sensory skills. Thank you for joining us!